I just finished reading this book, and really enjoyed it. It's the second book in the Alien series starring, Kitty Katt. I can't help but chuckle at her name. It gets me every time, lol. 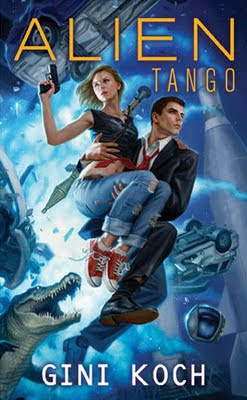 Just like the first book, it's filled with a multi-layered plot that has Kitty, the A-C guys, and several government departments running around like crazy while trying to outrun the bad guys, attempting not to get blown up, avoiding a clingy ex who still wants her, some alien haters, a disembodied alien entity, Martini's parents, and even alligators. Phew. That's a lot of stuff. And I can't forget to mention how hot her relationship with Martini is, although that also suffers through a few obstacles. This is another action-packed book, and while it does let you take a few breaths every now and then, something else soon pops up to ruin Kitty's day. She can take care of it, though. She might be a human woman surrounded by very nice looking aliens, but she's also got great instincts and can work through a lot of problems from a different--and sometimes, very odd--angle.